God of War 2 is coming next week! 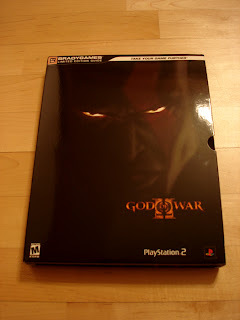 This is the God of War II Limited Edition Strategy Guide. 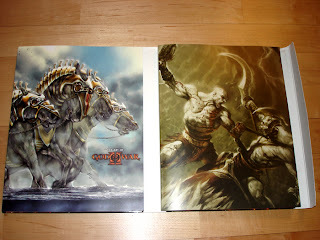 It's a slip case that contains a very nice strategy guide and a 112 page artbook. 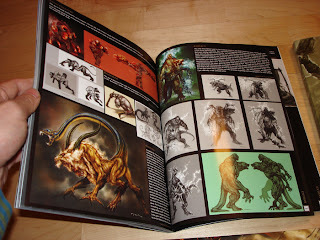 It contains a majority of the concept designs our concept design team did throughout the past 2 years. 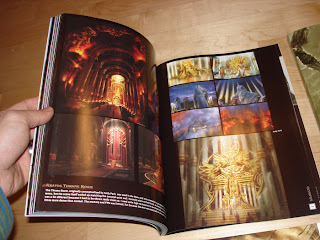 It also has many screenshots of 3D characters, levels, and environments to go along with the concepts. Congrats to my fellow concept artist buddies (Charlie, Cecil, Dwayne, Erik, Scott, and Ryan). And congrats to the rest of the amazing team over at Sony Santa Monica. We all had a blast working on a video game of this caliber. It's definitely been one of the most enjoyable experiences in my career. 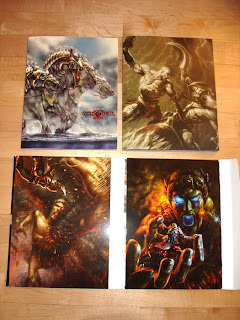 Thanks also to the great guys at Brady Games for pumping out an amazing product in such a short amount of time. Werd up man!--cheers to you for organizing the book and to all of us who bled for the game! Dude!!! Thank you for organizing it so well!! I have to pick up my copy next week!! Can't wait to put my hands on it!! Schweet dude! All of you guys must sign my copy of the art book! Congrats on finishing such an amazing project! Don't miss me too much at work! Oo my goodness!! Looks so delicious! I hope the book is going to be released in my country too. Hey Andy! Congrats on the book and it's nice to see you got a blog go'in. Can't wait to see some more paintings. I am a senior in High School, I noticed your concept art on your blog and your website and am hoping to be able to use you as an artist of referance for my art final. Because I too am also hoping to become a future concept artist and draw characters and creatures in games just like God of War. I know I still have a long way to go but I have the determination to make it. I was wondering if you could tell me what tools you use and if you could give me any advice as a future concept artist. I also sent you an email in your yahoo acount.